I have never been a "girly-girl" per se. I like to go shopping and have fun with my appearance, but I am not high maintenance in any way. 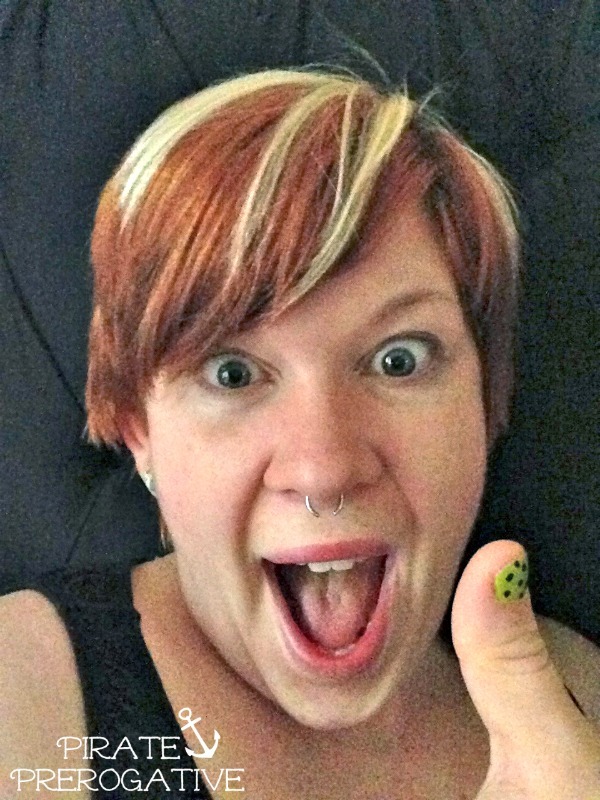 I am fine with no makeup and roll out of bed hair. Total benefit of short hair, by the way. I am also cheap. Very cheap. I don't like to pay for things I can figure out myself. I usually cut my own hair, always dye it myself, and really don't pay for someone else to take care of my personal appearance in any way. Oh, and have I mentioned I don't like being touched? I've had one mani pedi and I literally freaked on the lady when she started massaging my legs. My personal space was invaded, and I was not okay with it. It had been nearly a year since I had painted my nails. This photo was the last time, and just look how excited I was. I think that was probably the first time I had painted my nails in a good 5 years. Recently though, I decided to start painting and doing my own nails. 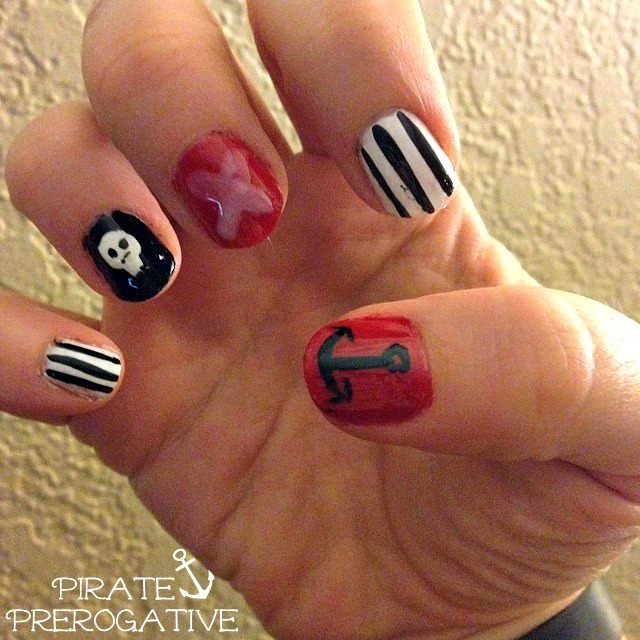 It all started when I was helping a friend find her next nail design. She is actually a licensed nail artist, so her own nails are always elaborate and eye catching. 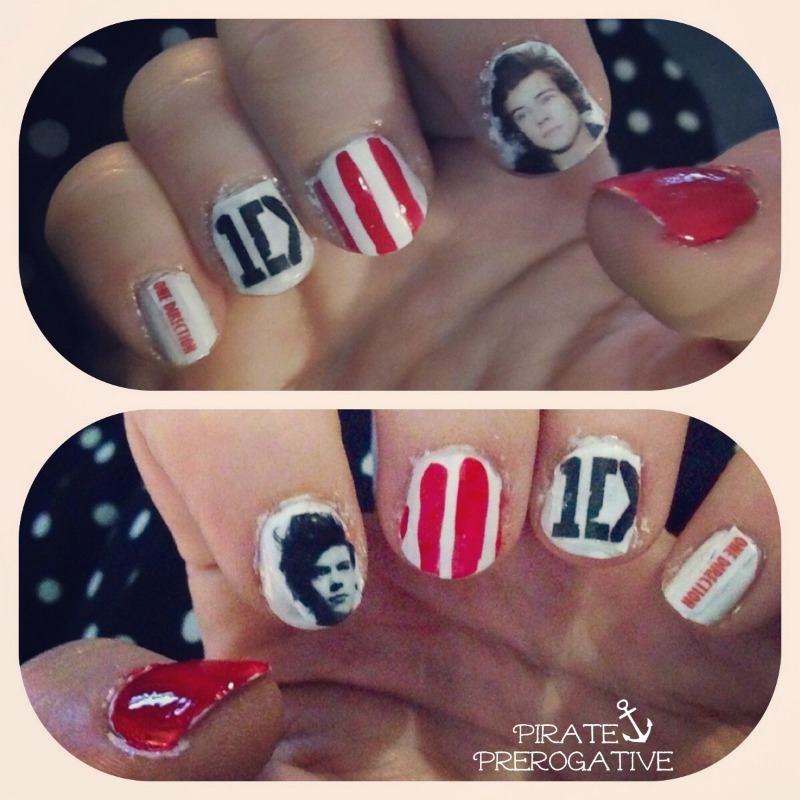 As I browsed through pinterest I thought, I could probably do some of these and jokingly said I would get some One Direction nails. Then that turned into a challenge. I quick search of youtube and google for some designs and I was ready. Here is the that very first attempt. Not too bad for my first try. Now to perfect the art of clean up. 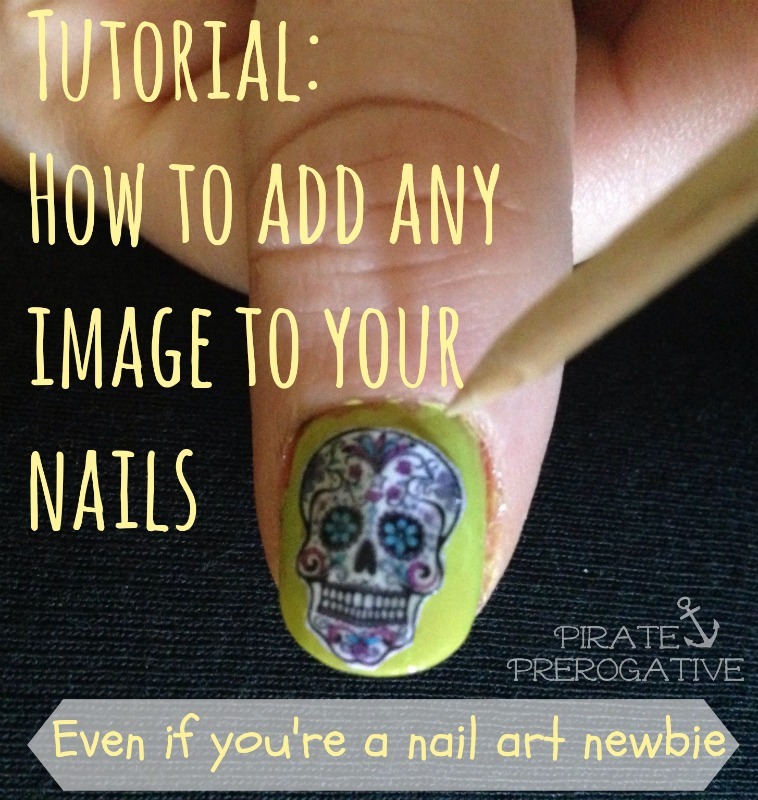 Don't worry, I'll walk you through the step by step process to create your own photo nail art later in this post. I had learned more about nails by the second time around, such as a cool thing called a striper. It's a thinner brush that helps to create perfect stripes. Just look at the comparison in my stripes from my One Direction nails and these. I made my own striper by thinning an old nail polish brush with scissors, because I'm cheap, of course. I freehanded the skull and anchor with a standard brush as well. I have turned to pinterest for inspiration when I just don't know what to do next, and that's where the next idea came from. I have always loved The Nightmare Before Christmas, heck, it was the theme of my wedding. So, why not accessorize my fingertips with it? 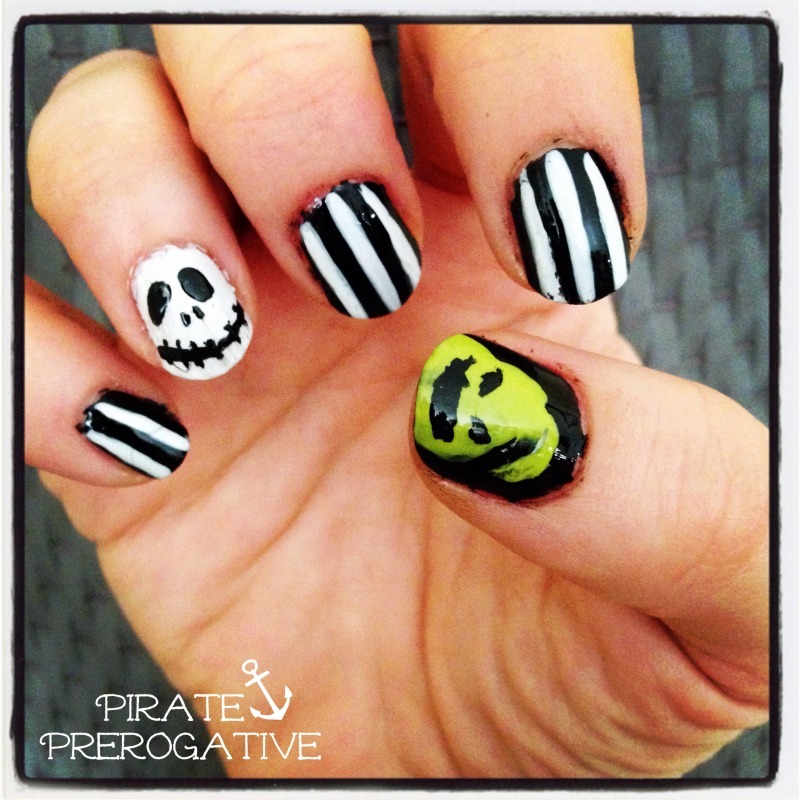 The Nightmare Before Christmas nails with Oogie Boogie and Jack Skellington. This was another freehand design with my homemade striper. I just looked at my reference photos and took my time. That's the biggest part to nail design. TIME! As a full-time working mom, that is something I don't have a lot of. I tend to do my nails after everyone has gone to bed. Nap time will work if I'm keeping it simple, but it usually cuts things pretty close and I end up with smooshed or smeared polish. My nail artist friend decided I needed to more tools for my designs. She loaned me some polish and a cool nail art pen. That's how I created this design. I have always wanted to tattoo my knuckles with this phrase, but it's certainly not that stage in life for me to have tatted hands. I once again turned to google for a reference on traditional tattoo lettering and got to work. The nail art pen worked nicely, and I drew that gun with my right hand! (I'm left handed) These nails were nap time nails, so they were a bit rushed. 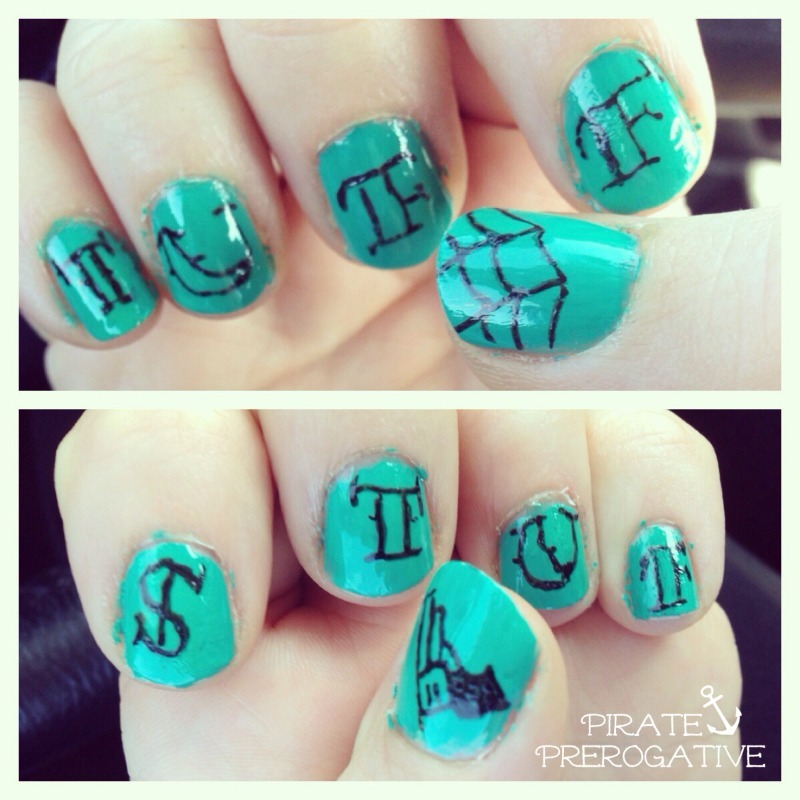 I have lots of ideas for more tattoo style nails that are more elaborate, keep an eye out on my instagram for those. My latest are a bit tatooesque, actually. 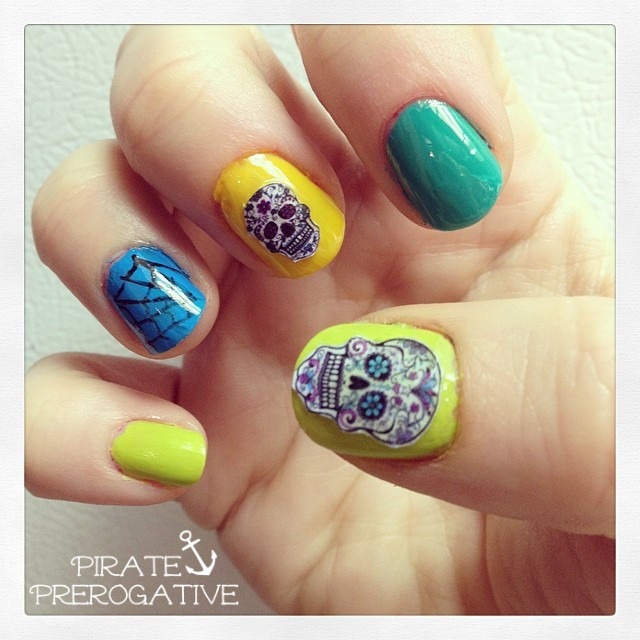 I was feeling festive, so I did Cinco De Mayo sugar skull nails. 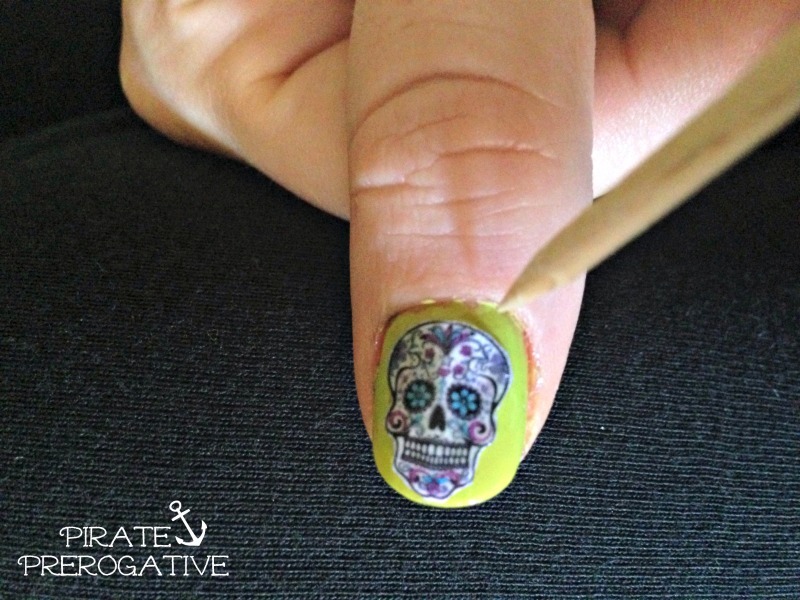 I was enamored with all the amazing sugar skulls nails on pinterest, but just couldn't pull off a freehand one for the life of me. I tried and failed repeatedly. It seemed like time to do another image transfer design. 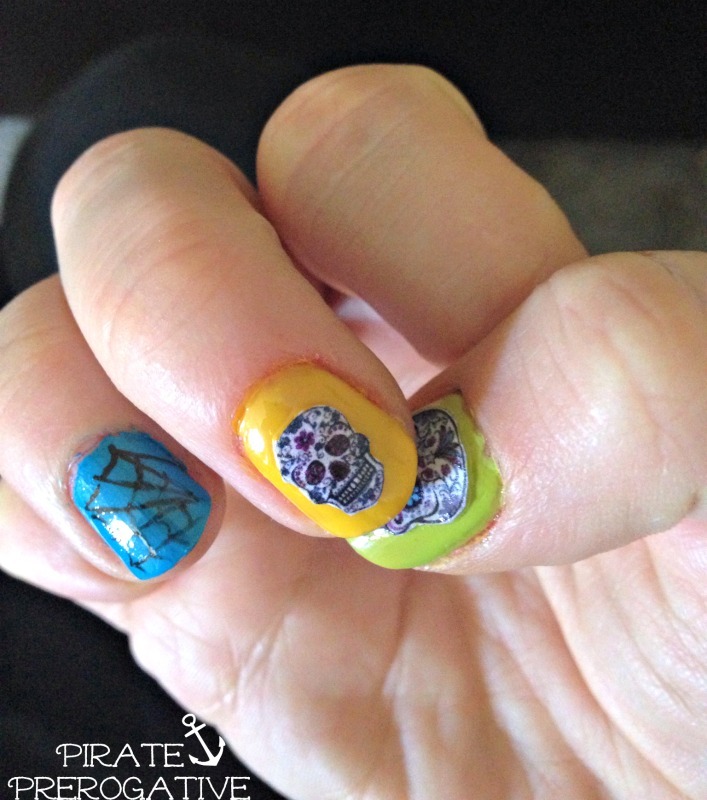 I found these two skulls, paired them with vibrant colors, and drew on a spiderweb. I thought about adding a flower, but it's just not my style. This was actually a pretty easy design, I promise. Let me walk you through it. 1. 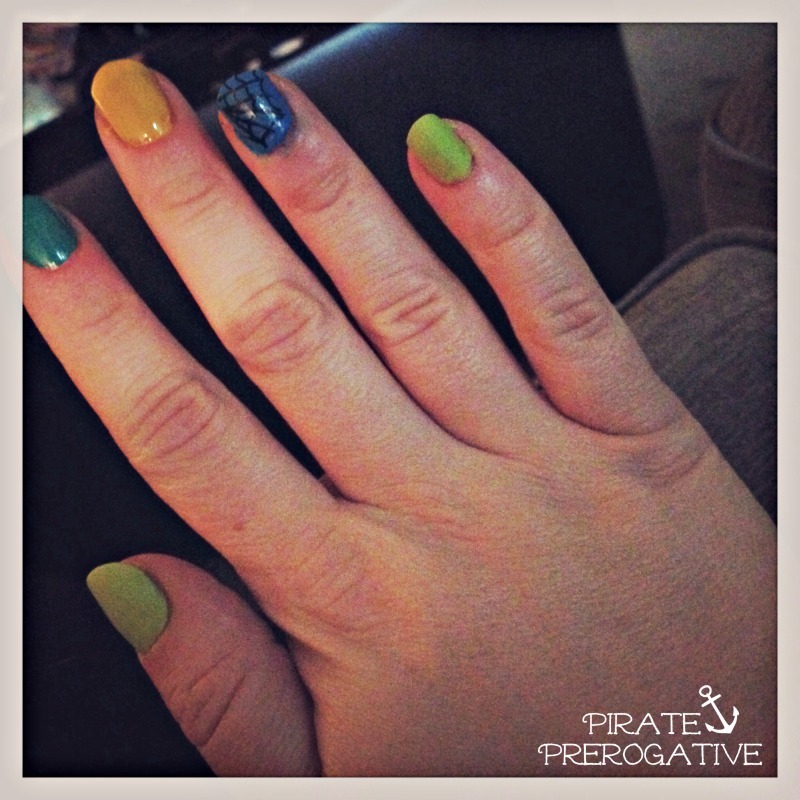 Paint your nails the desired base color and let dry completely. Do not use top coat yet on the nails you will be adding an image to. 2. 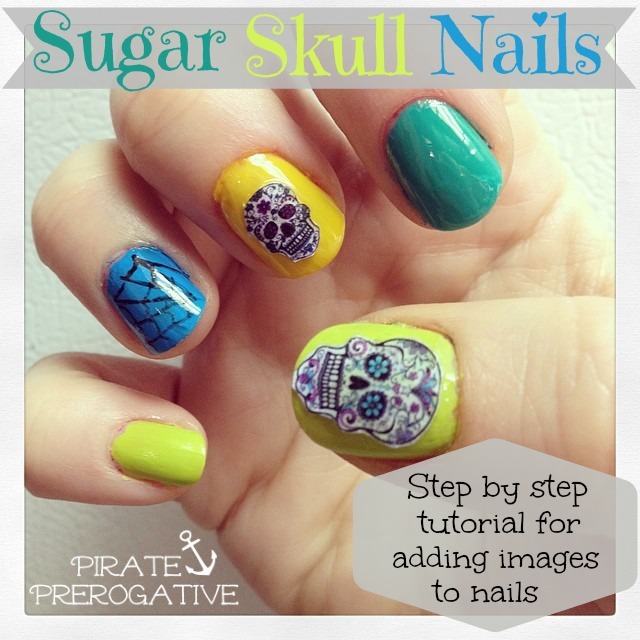 Perform a google image search to find suitable images for your nails. Make sure it is something that lends itself to the shape of your nail. Or, cut out of a magazine if it's already the perfect nail size. 3. Save the image and resize it in photo editing software. There are tons of free options. I made a collage in picmonkey so all my images would be on one page. Then I saved it at high resolution and opened it back up in preview. (I have a Mac) I then resized the images to around 1-2 cm. Be sure you do NOT resample the image when resizing. You want the same details in your tiny picture as in the large version. View your resized image actual size, hold your nail up next to the screen and make sure it will fit. Adjust as needed. Print your image onto regular paper. 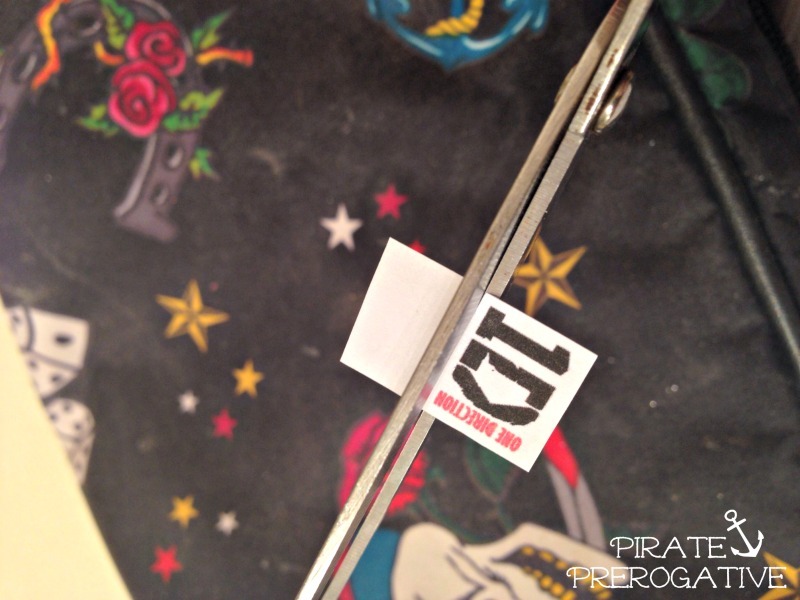 You can buy clear sticker paper, which would make things even easier, but again, I'm cheap. Be sure to your settings are to print images actual size, not fit to page. Cut out the image carefully, leaving no excess border. 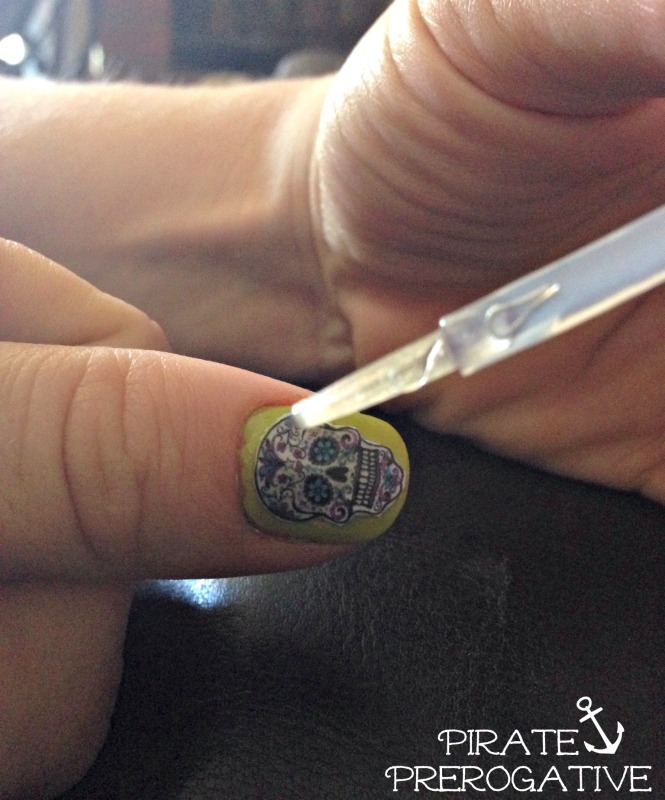 This is going right on your nail, so you will see any excess or cutting errors. 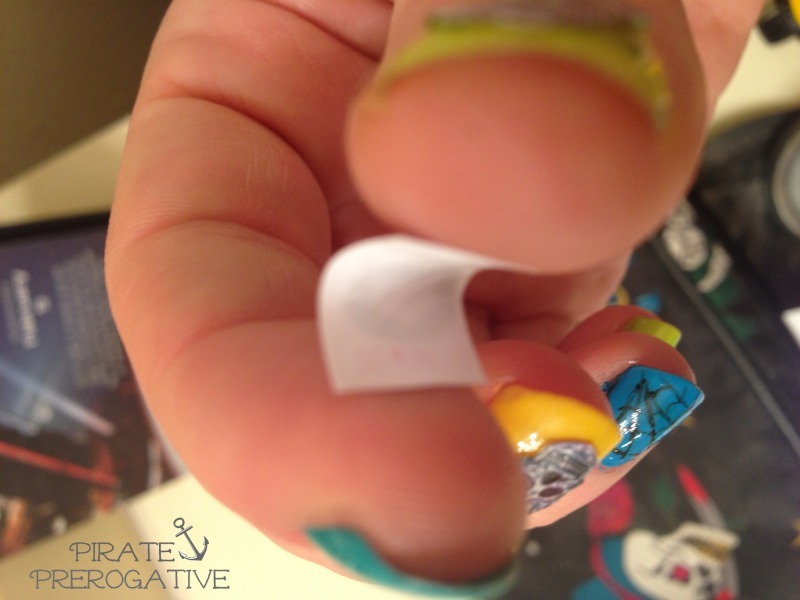 Gently bend the cut out image to create a curve that will fit your nail. Just a slight bend, no creases. It will fit your nail better than a flat piece of paper. On to polished, dry nails brush on clear top coat. Place your image onto your nails and gently press into place. I use both my fingers and nail care sticks. If you've got edges that aren't staying down, just place a drop of top coat on the end of a nail care stick and dab it under the edge. Continue to tap and press the image down until it seems secure. Let things dry completely, then top the whole nail, image and all, with clear top coat. Make sure you seal in the image so the ink doesn't run when you wash your hands or shower. That's it. Enjoy your unique new nails.